You may be pleasantly surprised by what I find. With the prevalence of HDTV today, consumer camcorders can now record full 1920×1080 HD, interlaced or progressive, and do it in AVCHD format at data rates (24Mbps) higher than 720p, MPEG-2-based HDV. Those factors that differentiate “consumer” and “professional” are usability and the quality of the images they record. Low-light capability—another clear difference between professional camcorders with more, better, and larger imaging chips—is not a major factor in this article. 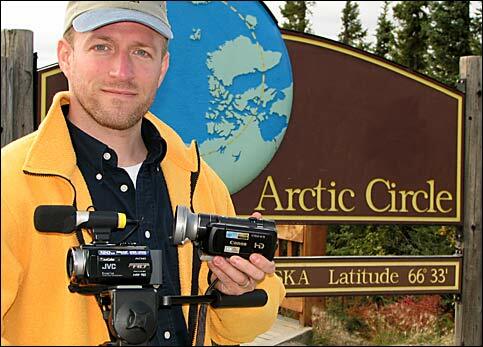 I will be using high-end consumer Full HD camcorders to reshoot an episode of an Alaskan outdoor adventure series that I shot in 1995, a month before MiniDV’s introduction. This is a test of usability and a feature comparison. The little camcorders used for this shoot are indeed limiting. They force the user to go through numerous tiny steps and adjustments to make these camcorders perform to anything like professional standards. But in the right hands, when you know how to get the most out of them, today’s consumer camcorders can produce startlingly good results. For this field production excursion, I used a JVC GZ-HD40U and a Canon Vixia HF-10A. Both of these camcorders are very consumer, meaning that any “advanced” manual features, if available at all, are several clicks away, buried in menus. The bodies of these camcorders are about the size of a 12-ounce soda can. While this dramatically limits the number of dedicated buttons on the camcorder, both of the camcorders I selected have microphone inputs as well as headphone jacks. This was critical because I planned to use these camcorders to record interviews and critical sounds with a variety of external microphones. The Canon features full 1920×1080 recording at p24, i30, and p30, the latter of which gives the viewer the ability to take advantage of full 1080 resolution without interlace artifacts, and without 24p judder. However, since the JVC records only 1920x1080i30 and I would be intercutting and directly comparing the footage from the two camcorders, I opted for the 1920x1080i30 format at the highest-quality setting available with both camcorders. Unlike Panasonic’s first “professional” AVCHD camcorder, the AG-HSC1UP, both the GZ-HD40U and the Vixia HF-10A use external batteries, which makes it far easier to replace a battery quickly while the camcorder is on a tripod and to use bigger batteries that offer longer run times. Having several hours of internal recording time possible is made more useful with batteries that last longer than a mere 60 minutes. However, both cameras ship with AC adapters that only charge the battery on the camcorder. This is quite limiting in that you can’t charge a second battery while shooting with the camcorder, unless you buy the optional separate battery charger. Neither of these camcorders uses tape, which is beneficial for the specific shoot I was undertaking: a drive up the unpaved Dalton Highway to the “top of the world” in Prudhoe Bay, Alaska. 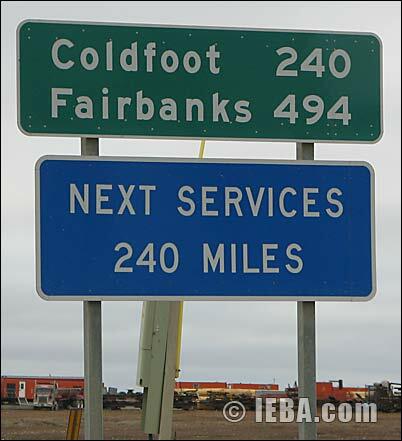 This is where they pump the oil that flows down the Alaska Pipeline. This road is very dusty, with a fine silt that is more like talc than dirt. After my shoot in 1995, I had to have both of my Fujinon lenses completely factory-overhauled to get all the Alaska silt out of the focus and zoom. With internal lenses, no tapes to change, and no doors to open, the Alaskan silt presents much less risk. Both camcorders have an internal LED camera light. This is a very helpful feature in consumer shooting scenarios, such as trying to shoot video of someone in a dark room in a house. But these single LED lights are not useful past 5’–10′ (depending on gain), and our needs required a stronger external light, which I had brought along. Lastly, despite recording full HD, both of these camcorders are quite small, especially compared to my usual shooting rigs. This enabled me to pack the camcorders, chargers, lenses, several wired and wireless microphones, headphones, power cable, video cables, filters, and a whole lot more into a near-briefcase-sized case. (More on this in another article!) In fact, the tripods and the computer weighed more than the entire camera kit. Let’s take a closer look at both of these camcorders. To begin with, the JVC has no power button. When you open the LCD screen, the camcorder powers up; when you close the screen, it powers down. It touts fast startup from “off,” and I can verify that from my experience with the camera. They say it takes about 6 seconds, but sometimes it seemed even faster than that. I never missed a shot waiting for the JVC to get ready. JVC also gives you a manual shutter over the lens, compared to the Canon’s automatic shutter. Both protect the lens, but the JVC can leave you guessing as to why the image is dark. The good news is they programmed the camcorder to show a “Check lens cover” warning in yellow that pops up after a few seconds. One of the current advantages of hard drive-based camcorders is a considerably longer recording time than compact flash memory, which still comes at a price premium compared to disk-based storage. 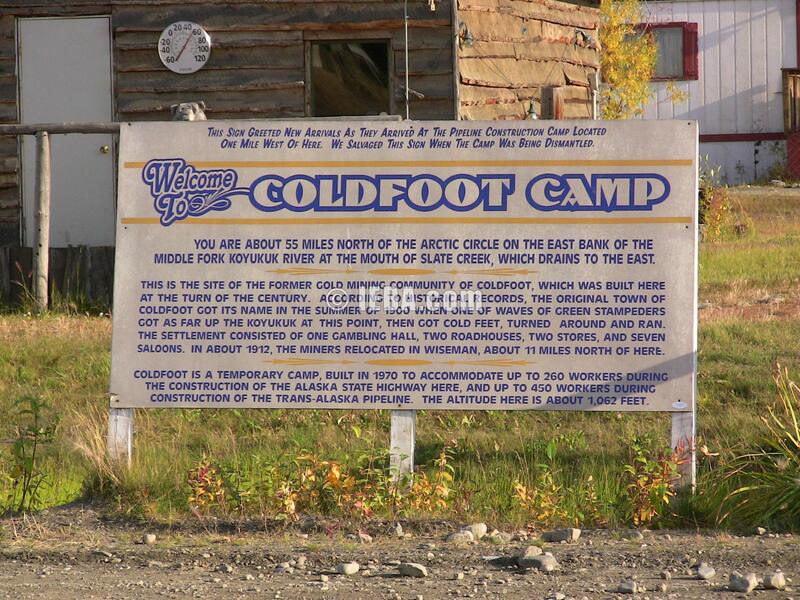 However, when out in the Alaskan wilderness where it is very quiet, the internal microphones registered the intermittent writing to the internal hard drive with a quiet click every second or so. I attached an external stereo microphone to the mic jack and put the mic holder in the standard accessory shoe on top of the camcorder. This made the audio considerably quieter, but the vibration from the hard drive could still be heard very subtly in the audio. If you take the microphone off the camcorder, there’s no hard drive noise, but now you have handling vibration. A mic holder that would offer good vibration isolation could be nearly as big as the diminutive camcorder itself, but for good audio, it may be what’s required. Most people will not encounter such quiet situations, and any wireless audio connections will also be immune to any hard drive noise. Much of our “road” footage was taken from inside a moving truck with the tripod standing on the floor in front of the passenger seat. I often zoomed all the way in to distant vehicles and objects to the side of the road, including road signs, and the JVC captured remarkably usable footage. The electronic image stabilization removed almost all the road vibration that the camcorder was enduring, producing some amazing shots. The larger bouncing motion of poor road conditions made it through, but that was tolerable when reviewing the footage. Working with this consumer camcorder’s menu system makes me appreciate how professional camcorders enable easy access to most any manual setting directly, without a lot of fiddling around and repeated button pushing. There were times I wanted to get in and adjust the exposure, but it was too much trouble to try and activate it on a moment’s notice. So in some shots, the overcompensation of the automatic exposure was evident. One major issue I had with the JVC was the camcorder’s hunting for focus on obvious focus points, for example, a single eagle flying high above against a cloudy sky. You see a single black silhouette in the center of the frame, in slow, graceful movement, and suddenly the eagle goes blurry for half a second because the camcorder decides to go and search for what to focus on. I did not understand why it felt the need to refocus. I’ve never had this happen with a prosumer camcorder with autofocus. The HF-10 came with both a wide angle and a telephoto lens, which proved to be very useful in my outdoor adventure shoot. As I have always believed, it is not the camcorder itself but everything that you surround it with that can really make a camera so very capable. I also had the BP-819 extended battery, which made capturing errant events less stressful because I was watching the camcorder’s battery minute countdown start from 150 minutes instead of 70 minutes. I was more comfortable leaving the camcorder on and could pause for long stretches of time. Actual still from Canon camcorder- full rez linked here. The Canon also has built-in Xenon flash. I found myself snapping high-resolution stills of various posters and signs rather than shooting video because I could drop that still image into the timeline in post and perform smooth and subtle motion on it then. I didn’t need to shoot three or four variations of it and waste several minutes of media for all the extra versions of the shot that will never be used. The problem with the flash is that it is right next to the lens. That made it unusable with the wide or telephoto lens converters because they blocked the flash and caused a bad shadow across part of the frame. The built-in LED light has the same problem. Since you need the screen to be open to frame the image, maybe Canon could put the flash on the back of the LCD screen, which extends several inches off to the side—or maybe a swing-out arm that would extend vertically over the lens for a more natural light from above. The Canon does an excellent job creating a safe environment for batteries. We have all heard of the Lithium-Ion battery recalls for laptops. The Canon takes all the battery contacts and crops them into a recessed, comblike contact center. You can’t even fit a dime in there. Nothing can be accidentally shorted unless you drop it in water. The JVC has large, exposed, but recessed contact areas. That’s good, but it’s nowhere near as safe as the Canon. The Canon, despite having “no moving parts” (aside from the zoom lens, optical-image stabilization, and internal focusing system), and instant access to flash memory, takes a few seconds longer than the JVC to get ready to shoot. JVC touts its quick-start capability, and I have to admit that when I switched to the JVC during the trip, it was noticeably snappier. A few times I’d hit the record button on the Canon in anticipation of it being ready and then start panning and zooming my shot, only to find that the camcorder wasn’t quite ready; it ignored me pressing the record button. This was frustrating. On the other hand, I was able to manipulate the Canon more easily. The zoom control was fluid enough that, even while bouncing around on a gravel road, I was able to start the camera zooming out at the slowest speed and hold it long enough to get a good “vertigo” shot of a distant hill. The colors on the Canon were nice and vibrant, even on overcast days. In comparison, the JVC colors seemed more muted. Canon’s joystick enables ready access to three specific features: manual focus, exposure, and microphone level. It can also toggle the built-in LED light on and off. Those three main features are the ones that pros will definitely want to access the most. Having those three features with near-direct access is handy. However, the amount of joystick nudges it takes to make adjustments can sometimes make it seem like quite a bother. For instance, holding the current exposure and knocking it down two stops is a five-nudge process: in, down, up, left, left. This is simple compared to adjusting focus, which does not give a numeric reading but merely zooms in to the image and lets you try to guess what is really in critical focus. 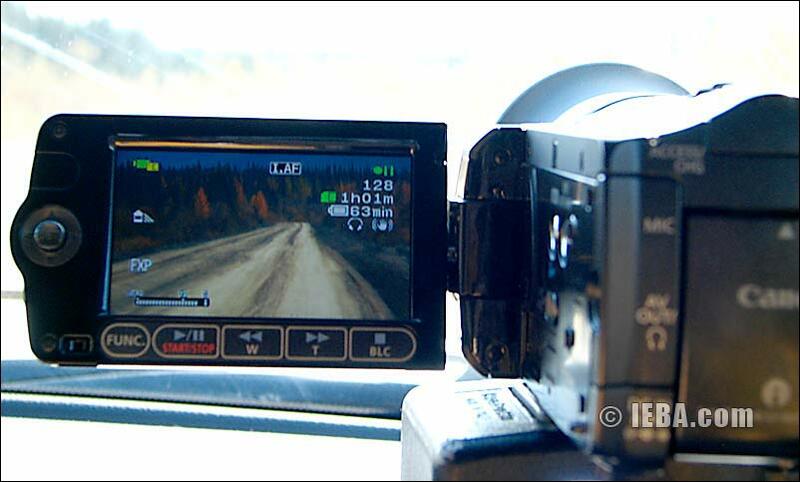 The Canon image stabilization was not as good at eliminating the small shakes of the rough road as the JVC. However, the optical-image stabilization was able to smooth out hand-held camera moves and the larger rolls in the road. When reviewing the footage, the small shakes that made it through were quite bothersome. 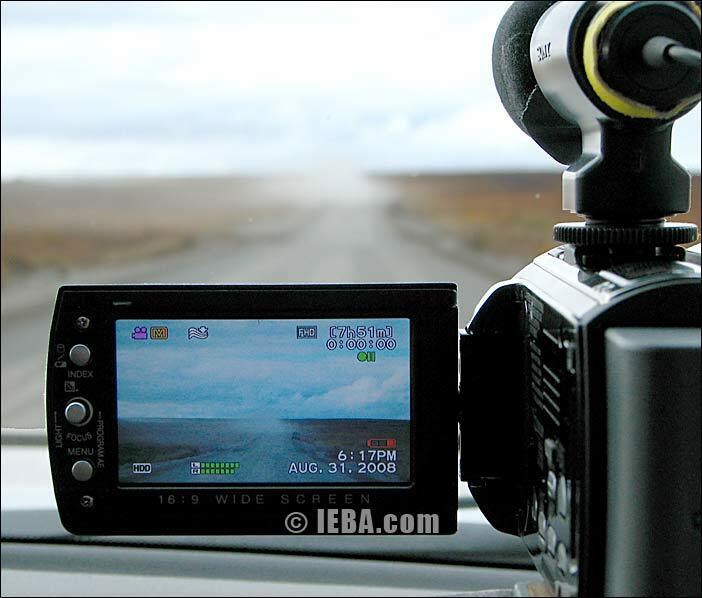 In fact, I’d have to admit that, in comparison to the JVC, for this very shaky road video, some of the shots from the Canon have too much image-shake to be usable. In addition, there were several times when I used the camcorder on a tripod and the optical stabilization system caused the image to move on its own, as if it were seasick and didn’t know what to do. It just floated around. Disabling the stabilization, which is generally the best course of action when the camera is on a tripod, cured this. But given that the feature is many menu button pushes deep, it’s not something I could easily turn on and off every time I put the camcorder on and off the tripod. JVC’s digital image stabilization had no such wayward image-floating. Taking stills with the Canon can sometimes be infuriating because you can shoot faster than the buffer can write to the internal flash memory. After five or so still images, you have to wait a good 40 seconds while the images are saved to the internal flash media. Just twiddle your thumbs because you can’t do anything else. This doesn’t happen when recording stills to the SD card. This came as quite a bother and limited the usefulness of the still image capturing capability—especially since there was no indication as to what was going on except the “access” light blinking on the back of the camcorder. Why is internal access so slow? For no reason I can fathom, there just isn’t a little camcorder available that gives mic in, headphone out, and LANC control of zoom, focus, iris, REC start/stop, etc. These camcorders offer the mic and headphones but no LANC. There are a couple that offer LANC but little else. LANC would have helped a lot with these camcorders, not just because of the minuscule and difficult-to-master zoom control levers but for direct control of focus and iris that isn’t available on the body of the camcorder. The lack of LANC makes no sense when the manufacturers go to great lengths to offer an extensive amount of other connectivity. For instance, the JVC offers mic in, headphone out, USB, AV out, component out, full-size HDMI out, a MicroSD slot, DC in, and a “dock” connector. And on the dock, there’s a FireWire connector and another set of USB, component, AV connectors, and DC in. All this, but no LANC. I don’t know if it’s something they overlooked so much as a problem of “feature creep,” which forces manufacturers to keep trying to make everything tinier instead of just more usable. Specifically, the reduced-sized camcorders force the battery to also be smaller, which means that, even though these camcorders use a tiny fraction of the amount of power that their counterparts used just a couple years ago, the current, much smaller, included battery still lasts only about an hour. Extended batteries offer more power, but there’s no all-day solution. Compare that to a professional camcorder system where 2 hours is about the minimum a battery system ought to last. Many systems offer 6-plus hours of run time, often from a single battery. The built-in mics pick up noise from handling these camcorders. This is especially prevalent in quiet situations when you are trying to go through the menus with the little joystick to adjust some setting. For the most part, these are not very good camcorders for making adjustments on-the-fly while recording. They would be OK for electronic field production (EFP) where you can set all the various parameters before recording and then leave the camcorder alone until you hit stop. Both camcorders require charging the battery in the camcorder. Although an accessory battery charger may charge the battery outside of the camcorder, it comes at additional cost. Without a separate charger, there is no way to charge a spare battery while using the camcorder, greatly diminishing the usefulness of having a second battery. Many prosumer models combine the separate battery charger into the power adapter so that one box can do either of these tasks as needed. Low-light capability on both of these camcorders is not even close to a prosumer camcorder. Even in dusk, outside with enough light to look around, the camcorders would “gain up” to unacceptable levels in order to capture a viewable image. The JVC’s low-light MPEG-2 “FHD” image looked messy, with the compression having a problem with the added noise from the grain. The Canon’s low-light AVCHD image preserved the noise from gain quite well, with random color noise being the most bothersome. Both of these camcorders use CMOS imagers. Image distortion caused by the CMOS imager was clearly evident when looking at still frames or watching full motion on a big LCD monitor. Again, we were recording in 1080i30, but hand-held shots of a rainbow sunset featured clouds that looked as if they were expanding and compressing vertically, as the CMOS imager recorded the vertical motion. Fast horizontal action, such as a truck zipping across the image, tended to look diagonal—very strange. Using a higher-speed shutter, which the camcorders did when there was plenty of sunlight, alleviated this visual aberration. The automatic iris/exposure of the camcorders worked well, most of the time. Several times the automatic exposure went too far in one direction or the other. For a high-contrast shot of a mountain in a shadow and a bright sky, you either lose one or the other or manually set an exposure in the middle where you lose a little bit of both. With the small consumer camcorders, there’s no way to manually set focus and exposure and adjust both during a shot. Both settings are several menu-clicks and button-pushes away. Easy access to just manual control at the moment you need it is what differentiates professional cameras from consumer camcorders like these. When connecting these devices to a computer, both camcorders noticed the computer, or the fact that something was connected. A screen on each camcorder’s LCD asked me to choose between backing up the data to an external DVD burner (a feature both cameras offer) or choosing a connection to a computer, at which point the device shows up on the desktop and you can directly access the media on the device. Because most flash media devices, or external hard drives, mount instantly without issue, the need to refer to the camcorder and select the connection to the computer each time the camcorder is powered on is annoying. I initially thought I had things connected improperly or that I was missing some device driver. I kept forgetting that I had to tell the device to connect to the computer. Can’t it just figure that out? There currently exists a huge gap in the market for a backup device for AVCHD or MPEG-2 TS footage. Professional photographers have several choices for battery-operated devices that let you copy your flash media to a much larger hard drive-based device, and the integrated LCD screen will let you review and even critically assess the images, zoom in, see histograms and EXIF data, and more. 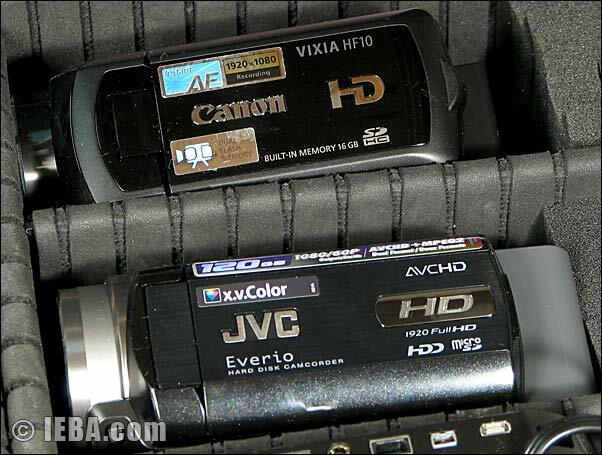 There are currently no such devices to do the same for AVCHD, HDV, or any Full HD video format. In fact, on this trip, I brought an older laptop that did not have the very latest versions of applications on it that are required for AVCHD playback. So the most I could do was back up the data itself and not review the footage on the computer. JVC’s USB jack does not look like the customary mini USB jack. While this initially caused some confusion, it works with the standard USB-to-Mini USB cable. One of the biggest draws for internal media, whether it is flash or hard drive, is that it is more convenient. For shooting, this is indeed the case. However, when you are not shooting, recording media that is permanently inside the camcorder presents new challenges. In addition to the professional problem that you cannot just hand media to a client after finishing the last shot, there is another specific concern for consumers—one that came into play on this trip. For security, you have to always carry the entire camcorder or camcorders with you. Whenever I left the room we stayed in, I had to carry along both camcorders and the laptop … to dinner, to breakfast, to walk around on a scouting trip. I wasn’t able to just carry the media in my pocket, or stuff the tapes into a Ziploc bag under the front seat of the car for security, because the footage is locked away inside of the camcorders themselves. Compared to the Canon, the JVC offers better audio I/O and metering but worse mic placement and manual control. The JVC offers a stereo meter with three colors. The JVC also has a dedicated headphone jack whereas the Canon requires a menu adjustment to use the AV jack as a headphone jack. Canon only offers a mono audio meter in one color. But the JVC’s built-in mics are on top and not in front, and it only lets you adjust the audio level by ± 1 or 2, whatever that means. The Canon lets you adjust audio levels manually down to nothing. The JVC offers the widest selection of recording formats (three AVCHD and four MPEG-2 TS data rates) but only at one standard frame rate: 30i. The Canon only records AVCHD at three data rates, but it also offers three different standards: 24p, 30p, and 30i. Given a set data rate, reducing frames to 24p means there’s more data (and image quality) for each frame. Canon did put in an external microphone input, but it compromised several other related aspects that make manual audio much harder to come by. For instance, Canon adopted the use of a smaller, proprietary hot shoe. So, while I could plug in an external shotgun or stereo microphone for better sound, there was no easy way to attach it to the camcorder. This limitation really becomes irksome because you can’t use anyone else’s on-camera light in the now missized hot shoe. In fact, you can’t even use Canon’s own Advanced Accessory Shoe accessories because this hot shoe is the Mini Advanced Shoe, not the regular one. These two consumer camcorders have a few features that make you wonder why similar features are not available on professional camcorders—or, if they are, why they are so costly or cumbersome. The first of these is the built-in LED light. Digital SLR cameras have a basic flash and allow you to connect a far more capable big-flash unit. The little flash is often quite capable and sufficed in many cases. Pro camcorders just don’t offer any forward illumination, aside from a REC tally light, and it really makes you wonder why. Clearly, if a $500 camcorder can have it, it’s not that expensive or difficult to incorporate a few front-firing LED lights for illumination. It would also help fill in faces and offset grain from high-gain images when the subject is close enough. Sure, we’ll use a nice big light when needed, but LEDs can suffice if the amount of light needed is small. An on-camera LED could also add a bit of “sparkle” as an eye light. JVC’s use of a 120GB hard drive means there are no media changes, even at the highest data rate (higher than HDV) for more than 9 hours. Sure, you can’t hand off media to a client, but that’s not what this consumer camcorder is made for, even if you plan to use it for professional work. In terms of going on a trip and not worrying about having enough media, I can’t imagine recording 9 hours of video on a trip, even if I were deliberately overshooting, as I was on this Alaska trip. Moreover, when you understand that you get the hard drive recorder, the camcorder, and the playback device for one-third the cost of a professional hard drive recording system based on the same hard drive, you really have to ask why the professional systems cost so much and do so little. Nine hours of the highest bitrate AVCHD on a removable 1.8″ hard drive would be quite a paradigm changer in the prosumer world. A 120GB FireStore—the standard-setter in the direct disk recorder market—costs twice what this JVC costs. There’s an opportunity here for JVC to take the prosumer world by storm with a prosumer removable hard drive camcorder or a capable alternative to the FireStore. Taking still images to flash media while recording video (without a glitch) is a very useful feature. Too bad professional camcorders can’t do it. Some prosumer cameras can, but it’s hit or miss with the quality, and generally, the still image size is limited to the frame size of the video. If there’s a 5-megapixel sensor in there, I’d like a 5-megapixel image while recording 1080i video (which is 2-megapixel). JVC’s dock is not unique, but it makes working with the camcorder in a home studio situation much more convenient than constantly having to plug and unplug numerous wires every time footage needs to be downloaded from the camcorder. Why are professional camcorders that use flash media still forcing professionals to fork over thousands of dollars to access the footage when consumer camcorders can enable this with accessories included in the box? The connectivity in these little camcorders is actually quite amazing. As I mentioned, the JVC not only gives me USB and FireWire connectivity, it also gives me headphones AV out, component, and full-size HDMI—all on the smallest camcorder I have used. Plus, all the AV and component cables are included. If you step up to prosumer camcorders with considerably more surface to get I/O jacks, you’ll see they can no longer give you a standard video BNC or S-video jack. Despite having four to eight times as much surface area, the larger camcorders use the same proprietary connectors as these tiny wonders to save space. I can understand that claim on something as small as these consumer camcorders, but not on anything prosumer or larger. It was an interesting experience making these little camcorders do my bidding while dealing with the menu systems and other inherent limitations. But it was also enjoyable to let these little devices sometimes assist me in not only getting the shot but in being discreet amid busloads of tourists taking the same trip and stopping at the same stops. I didn’t have to constantly answer questions as to what I was doing; I was “just another tourist” shooting some video with a little camcorder. In terms of using these camcorders for a professional production, I would limit that use to auxiliary views of a scene where there is at least one prosumer (three-chip) camcorder or better as the primary means of recording the action. Then, I would manually set these camcorders’ shutter, gain, focus, etc., beforehand to help ensure that they don’t suddenly go wonky (such as hunting for focus) right at the critical moment. In terms of audio, the quality of the audio recorded cannot be judged by road noise, ambient sound, and interviews. We achieved acceptable audio with the external wired and wireless microphones we employed. After reviewing hours of footage from these two high-end camcorders, I’ve concluded it’s a battle of different features. I have to admit that the Canon produced more vibrant and prettier images. It also provides easier access to the three manual settings you’d need most. However, the JVC’s image stabilizer did a better job on our shoot. The JVC provides gobs of storage: 120GB versus 16GB on the Canon. And while the Canon offers more frame rate recording adjustments, the JVC offers more recording codec choices and a higher overall data rate. When reviewing the footage between the two camcorders, aside from the vibrancy of the colors on the Canon in the “vivid” setting), the quality of the images was quite comparable, and my partner and I were often hard-pressed to tell which camera recorded which shot. We had to refer to our daily log for specifics. The JVC’s electronic image stabilization provided better, more stable images more often than the Canon. I wasn’t able to see the annoying, very small image jitter on the Canon’s tiny 2.7″ LCD screen when reviewing the footage in the field. So we kept shooting with it. I didn’t have access to our 32″ review monitor during the trip. Maybe there’s an additional issue with the refresh rate of the camcorder’s LCD screen in that the very fast jittery shake just can’t be reproduced. The manual audio settings of the JVC make almost no sense, and the manual isn’t much help. But if we set the focus manual to infinity, then we could have easily shot the whole thing with the JVC and had almost no bad shots. In fact, the JVC HD40 would have shot everything at the highest data rate of 27Mbps and it still would have only been about half-full. Because models and specific features of consumer camcorders change far more often than professional or prosumer camcorders, the specifics of this review will likely not apply to other models of camcorders. But through thorough hands-on testing, you can find out what a given camcorder’s strengths and weaknesses are and then use that tool appropriately, just as you would any other piece of production gear. Special thanks to my driver – Peter – for all his work.